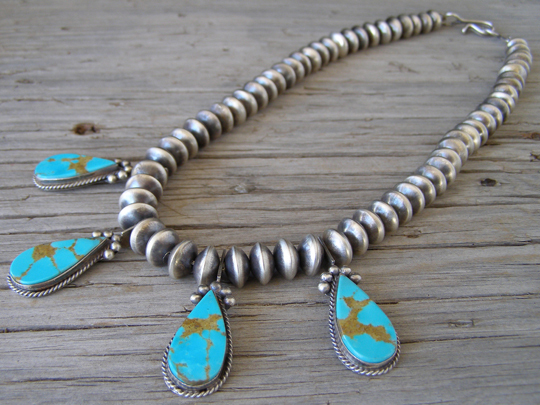 Navajo silversmith Selena Warner created this pendant necklace using four teardrops of natural, untreated blue Royston turquoise strung on a strand of handmade Sterling beads. This is a nice combination of pretty blue Nevada turquoise stones set simply in smooth bezels wrapped with twist wire and highlighted by arcs of raindrops above the stones. The lentil-shaped handmade beads are lightly brushed and have a soft patina of oxidation. At nineteen inches, this is a nice choker length. Hallmarked SW and stamped Sterling on the back of one of the pendants. Stones: 4 teardrops 1" x 1/2"